I will present you in this Tutorial, how to register to Gate.io and start to trade your Cryptocurrencies on this Exchange Platform. First, what is Gate.io ? Gate.io is a Cryptocurrency Exchange Platform that is still young, but got already a high volume of exchanges. The Platform have a large variety of USDT Markets, and could be interesting for people who prefer trade with Tether, rather than Bitcoin. On Gate.io, you cannot buy Cryptocurrency directly with your Dollars (or Euros), but you can deposit Bitcoin, or any other Cryptocurrency avaible on Gate.io, to trade it with other Cryptocurrencies. If you don't have Bitcoin or any Cryptocurrency, you can follow this Tutorial to buy your first Bitcoin with CoinBase. - Transactions fees are at 0,2% and can be put down at 0,1%. - The Website is easy to understand and to use. - A large variety of Markets and different Cryptocurrencies, from which a lot are tradable with USDT/Tether. 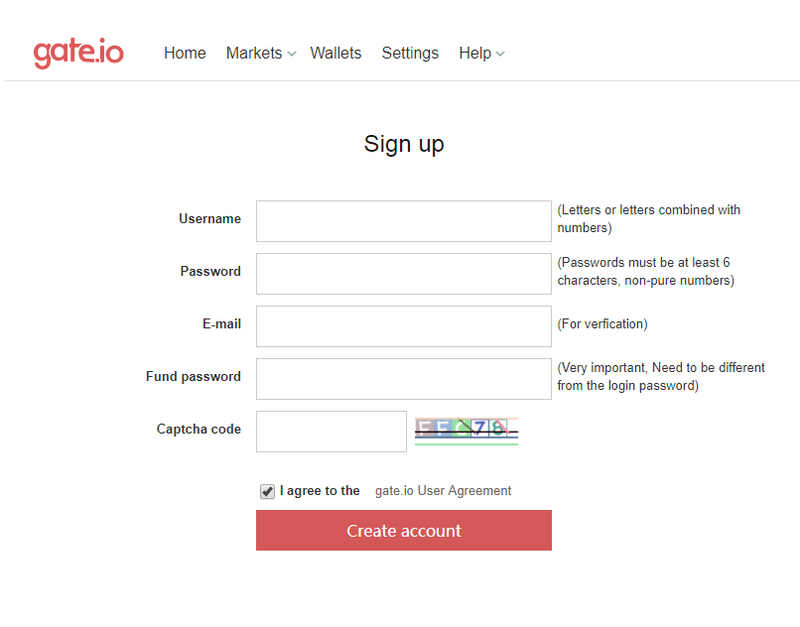 You can directly register in the "Sign up" part, by choosing a Username, a password for the account and put your E-mail. You will also have to choose a "Fund password", that will be needed for trading and withdrawals. You will receive a confirmation E-mail on your address to create your account. If you can't see it, check your spams. Once you clicked on the confirmation link, you can log in. Now that you are on the home page, to make your first Deposit, you have to click on "Wallet" on the top left of the page. You will then see the list of your funds for each cryptocurrency, and the estimation in Dollars (USD). To see your Deposit address, click on the red "Deposit" button on the right of the currency you want to Deposit (Bitcoin in the example). You can also search for a currency with the tool on the right of the screen. You can now see your Deposit address (Bitcoin in this example) on which you can send funds. Be careful, you got a different address for each cryptocurrency, send only Bitcoin to your Bitcoin address. Once you've make your first Deposit, you can now start trading cryptocurrencies. First, go to "Markets" on the top and choose on which Market you want to trade (BTC / ETH / USDT / QTUM). If you Deposit Bitcoin, choose BTC, but the Market with the most currencies is USDT. Then, choose the currency you want to trade in the list. 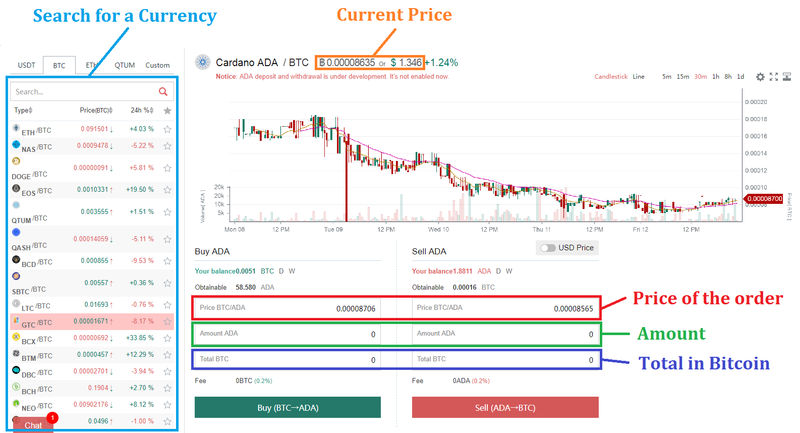 In this example, we choose ADA/BTC. To buy or sell, it's easy, you just have to choose the price of your order (here in BTC) and the amount that you want to buy or sell. You can see the Total price in Bitcoin on the bottom. You can also see the current price on the top of the page in Bitcoin and in USD. To make a withdrawal, you just have to go back to the "Wallet" tab, and click on the green "Withdrawal" button, on the right side of the currency that you want. You know now how to use Gate.io, and start to trade your Bitcoin or Ethereum for other cryptocurrencies on this platform. Here is a TOP 10 for the best Cryptocurrency Exchanges. -Fiat Exchanges, where you can buy Bitcoin directly with dollars or euros. -Alt-coin Exchanges, where you can trade your Bitcoin to other crypto-currencies. -Peer to peer Marketplaces, to directly trade Bitcoin, without a third-party. All with details about how to register and how to buy your Bitcoins and Alt-coins. CoinBase is one of the most popular exchanges to buy cryptocurrencies with Euro or US dollars. You will have to put your real First Name, Last Name, E-mail and choose a Password. You will also have to prove your identity on Coinbase. You can buy with credit card or by Bank wire. You get 10$ for free when suscribing and making your first buy. For the moment you can buy Bitcoin, Ethereum and Litecoin. The website is very easy to understand, it makes buying Bitcoins very simple, especially for beginners. What is Theta Token (THETA) ? Where to buy it ? What is Theta Token ?Theta Token (THETA) is a decentralized video streaming platform, powered by users and an innovative new blockchain. Innovations include Proof-of-Engagement, Reputation Dependant Mining, Global Reputation Consensus. Theta is the only end-to-end solution for decentralized live video streaming, providing both technical and economic solutions. The first innovation is that viewers can earn rewards as THETA tokens for sharing bandwidth and resources. A viewer can earn Theta tokens as a direct reward and share it back to the creators. High quality, smooth video streaming is made possible thanks to a peer-to-peer decentralized CDN that delivers streams efficiently throughout the world. Theta Token allows reduced cost of delivering video streams. Publishers and content creators no longer need to develop expensive infrastructure, allowing for more innovation and unique business models. What is Tron (TRX) ? Where to buy it ? TRON (TRX) is a blockchain-based decentralized protocol that aims to construct a worldwide free content entertainment system with the blockchain and distributed storage technology. The protocol allows each user to freely publish, store and own data, and in the decentralized autonomous form, decides the distribution, subscription and push of contents and enables content creators by releasing, circulating and dealing with digital assets, thus forming a decentralized content entertainment ecosystem.Peiwo App with over 10 million users will become the first TRON-compatible entertainment APP. The protocol used by TRON currently enables the digital entertainment content providers to interact with ordinary users to what is touted as an unprecedented level. All of that without having to pay a high price for Google Play, Apple Store and other distribution platforms.